My wisteria tree, is still a vine, simply trained as a tree. This takes an incredible amount of heavy pruning two or three times a year, with whips and stems often 4 or 5 feet long being removed in mid-summer, autumn and a bit in the early spring. With such care, even this young vine produces a prodigious amount of flowers. Few plants can compare with the romance of wisteria. Even the name conjurs up romance - of palaces with dripping, violet-tinted vines cascading like waterfalls in a Disney animated film. For gardeners who are more savvy, the vine can cause dread and fear, in much the same way that a timber bamboo can, as few plants can be as invasive as an untamed wisteria, out of control and overtaking every tree and shrub in its path. Yet once can master training this vine, as it needs training. Here is how I do it. 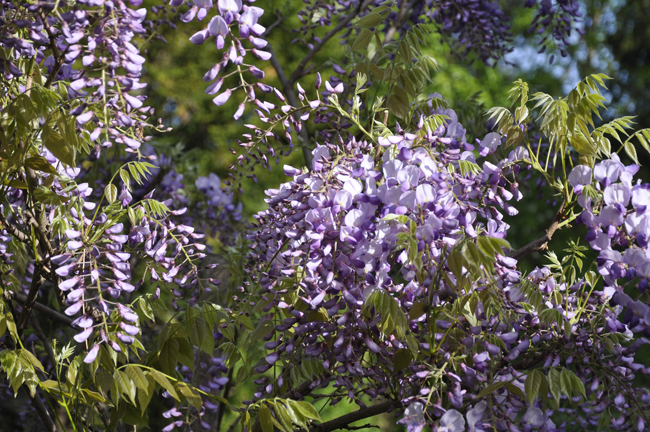 Click more, below for my tips on growing and training wisteria. Most vines can be challenging, some gardeners will tell you to avoid wisteria, for it can be weedy, invasive even, but the truth is all vines can be invasive, it's in their nature to be aggressive, spinning and twining their stems in a desperate effort to reach a position where they can take advantage of light. Vines are botanically designed to climb, through bushes, scrub and trees, aggressively trying to get above any competitive foliage. Japanese strains are supposed to be more fragrant than Chinese forms, but I think this is all silly, for I have some Japanese strains that have hardly no scent, such as this large-flowered violet form, while some Chinese forms smell exactly like orange blossoms. Even though Wisteria can be extremely invasive, even seeding in woodlands threatening native species, but at the same time, it's a vine which has charmed us, captured in artwork and in iconic old gardens in Italy and France, many who start gardening dream of someday having a wisteria vine in full, cascading bloom. They present the ultimate in romantic garden displays, Hollywood frequently drapes pergolas and trellis' with silk wisteria (fooling only a few of us when we spot it in a film), and classic artisans such as Tiffany capture the iconic image of twining wisteria in stained glass lampshades and in windows. But how can a home gardener tame a wisteria vine, and then, once tamed, how can one get a wisteria to bloom? For we've all heard about their fussy behavior through legend and lore. I, am about to set things straight. Wisteria macrobotrys has long, drooping trusses, which when completely open, can make my fence look like a waterfall of cascading color. My collection of wisteria varieties is growing, but I still have room for more, the problem I have with wisteria is not getting them to bloom, but is simply trying to find reliable and named selections that are accurately true to name ( as they cannot be raised from seed, unless one wants a lesser throw-back). 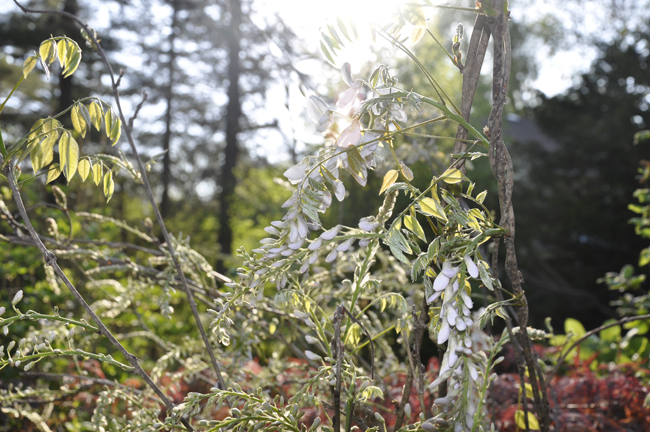 Wisteria deserves a second look by us gardeners. If you have a fence, a pergola or even a space where you can train one into a tree form, a wisteria vine can be very rewarding. Even if you only have room for a large tub, a trained vine in a container -even as a bonsai, can make for a very impressive plant. The trick with wisteria is not in fertilizing ( they they rarely bloom if presented with rich soil) - success comes with proper pruning. Wisteria must be pruned back fearlessly, and hard - ideally once in July, cutting all whips and stems back to the main trunk, leaving a foot or so of stem which can be allowed to form buds for the following year, and a second pruning in early spring, or late winter - just before the vines start to grow, and flower buds begin to swell. I keep 5 selections of both Japanese selections, and Chinese forms. One really never knows what one has when it comes to wisteria, as seed raised strains are far more prevalent than clones. 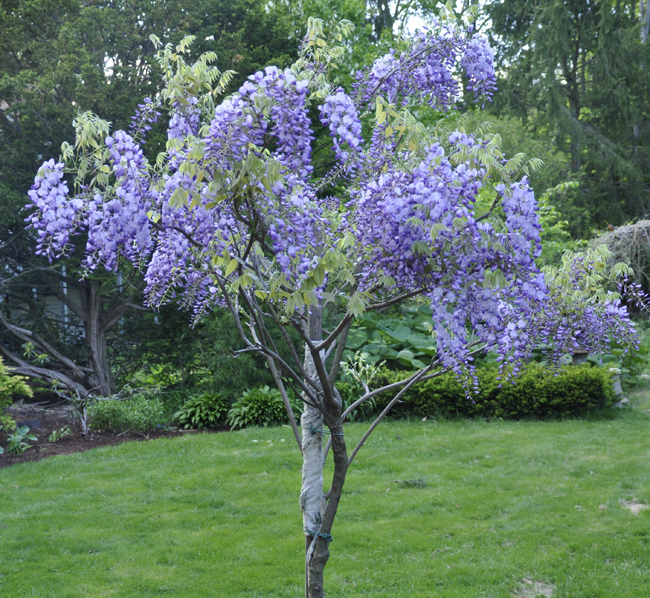 The name wisteria has a story behind it too - the genus should have be named Wistaria, and not Wisteria, as it was named in honor of Professor Caspar Wistar of the University of Pennsylvania, but an unfortunate misspelling while registering the genus has for ever kept the name Wisteria. Regardless of misspelling gripes and muddled genealogy, there are today countless strains and selections once one starts looking, and each has its qualities, be it fragrance, color or floral quality. Some varieties have very long trusses, nearly 2 feet long as in W. macrobotrys, others, particularly some of the newer Japanese floribundas have large, individual flowers on short trusses. Another interesting fun fact is that reportedly the Chinese varieties have stems which twine clockwise, whilst Japanese forms twine in a counter clockwise manner. 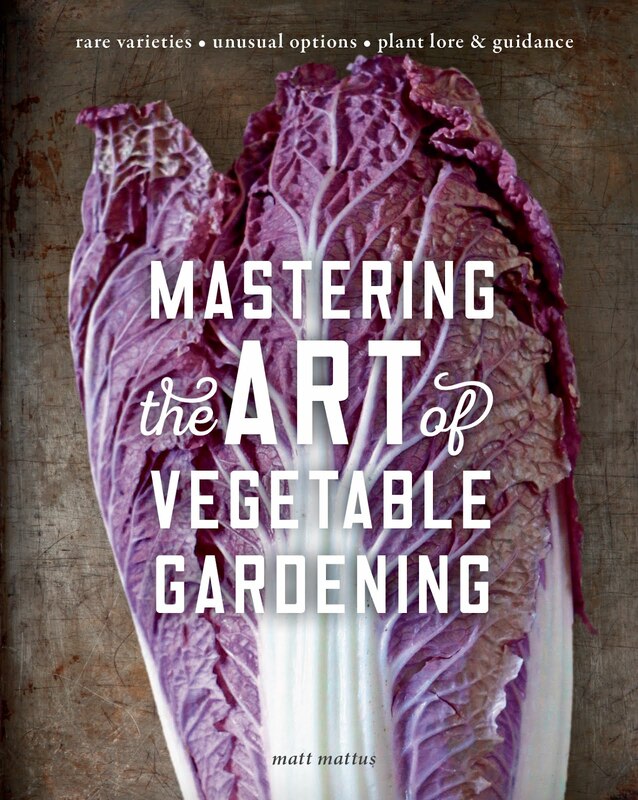 I have never tested this, but it's legend in many gardening books, and I would love to hear more about why, and if it is actually a true fact. This white Chinese wisteria, has an incredibly rich scent which drifts across the entire garden - it smells like a lemon tree in full bloom. It's more tender than any other variety I have, but after 12 years, it still produces flowers each spring, unless we have a very cold winter. It has never had so many flowers as it does this year. There are pink, rose, reddish mauve, violet and white forms of Wisteria, all with varied lengths of trusses. The choices selections tend to bloom before the foliage emerges, others, just as the foliage opens, and the more wild forms, bloom after the foliage has unfurled. 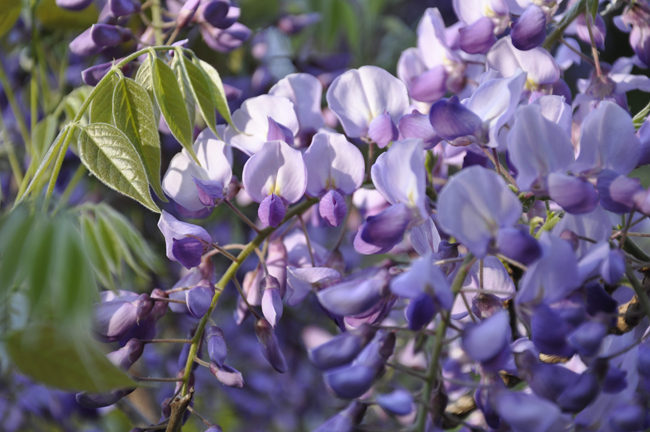 If you are interested in growing wisteria, I just ask you to buy named varieties, and not allow someone to pass on a vine to you, as it most likely will be seed raised, which will result only in disappointment. If you are going to bother pruning and training a vine that can live well over a century, you might as well spend that effort on a choice variety. My trained wisteria tree, is not really a tree, but simply a young vine of a particularly large flowered form, pruned hard each year, which helps to force the vine into bloom. After ten years or so, the stem will be strong enough to stand alone, without a stake or rope to keep it erect. 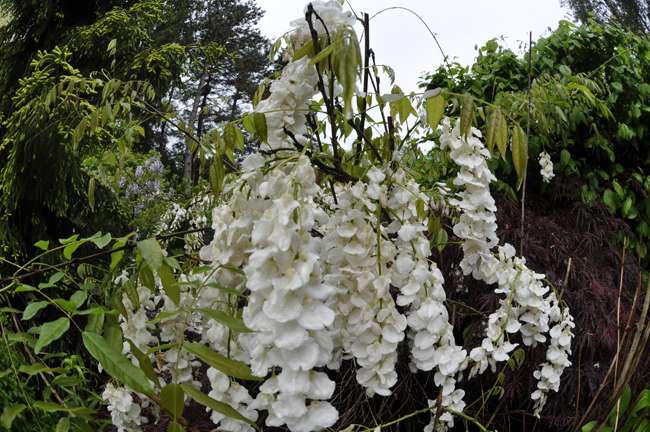 A Japanese white form, called White Snake, or Shiro Naga Fuji, has spectacular white blossoms. I keep this one trimmed short, it is almost free standing in the garden, yet it rarely twines at all, a Japanese maple helps to prop it up. 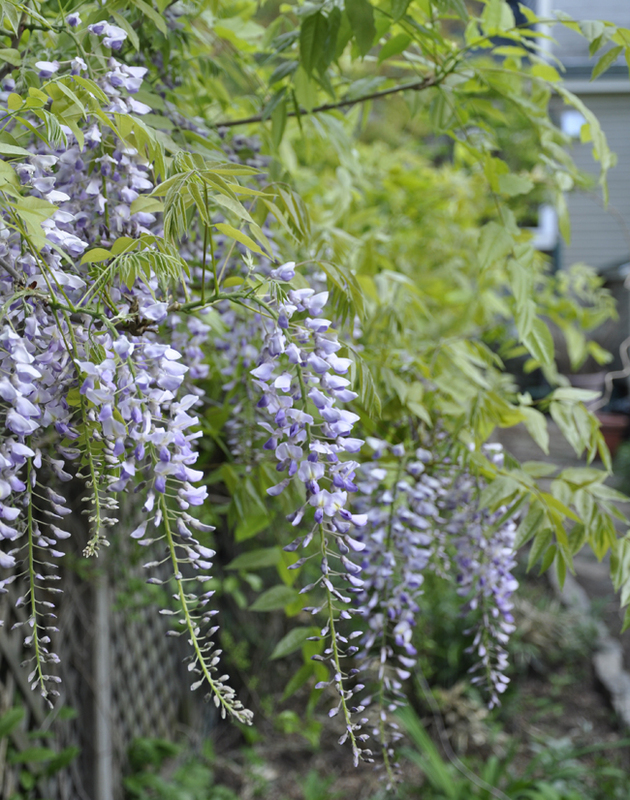 That said, if I missed just one year of pruning any wisteria, my garden would be overrun. I have many fond memories of wisteria as a child. In the woods behind out house, our neighbor allowed long wisteria vines to clamber up into tall ash trees, which would transform into bloom in May with long, purple blossoms making what could have been a boring street tree to suddenly become a giant wisteria tree, to memories of Nice, and Cannes in France, where like many of the coastal villages on the Cote d'Azur, wisteria arbors come into bloom over walkways in public parks and gardens. I Nice, I remember a long walk under such an arbor where steel archways and long wires connecting each one transformed into a violet tunnel one spring. Wisteria now has a pest -- Kudzu bug. Ours was covered. There is no Kudzu around our part of Georgia, so the Asian bugs headed for an Asian plant. I'm just glad they chose Wisteria instead of Azaleas but I'm keeping a close eye on the figs. Thank you for "setting the record straight" on Wisterias. Here in southeastern Michigan there are plenty that go untrimmed and overfertilized and barely flower, though just yesterday I came across one that had escaped into a little woodland by the side of a rode and was just enveloping it in a fragrant purple haze, as one sees relatively commonly in the Northeast. People in Europe seem to be more aware of the benefit of trimming Wisterias in gardens. In the part of Germany where I lived as a child, they are very common, everyone prunes them hard all through the summer, and they all flower stunningly. What a timely post for me! I'm about to embark on a wisteria journey, just bought my first plant last week I plan to train into a small tree. I'm a bit disappointed to learn about wisteria from seed as I just ordered some. I did this knowing it may take 10-12 years before they bloom as I plan to grow them as bonsais, but you also mentioned they're likely not good strains? is that always true? HI Ellie, I have some from seed that flower well enough, they just don't have flowers as large as the named selections, but they still make find specimens,some even have more flowers, and longer ones. I would say that the color may be the greatest difference. These more 'wild' forms have a color which is slightly more muddy, when viewed side-by-side the fancier selections. Is it possible to wind the whips around each other to produce the tree effect? I saw some hibiscus done that way that looked much more dramatic than mine (a.k.a. rose of sharon). Hi Diane, I would not wrap whips around for two reasons - first, remember that a wisteria will grow quickly - 10-15 feet a year once est., and each one of those buds on those whips will produce another long whip next year. Get the picture? The second reason is eventually, those whips will become as thick as a body builders biceps, which will be problematic. As you train, imaging what key branches you want as your "tree branches" as they thicken. Remember, it's really a vine! If you want to wait until those whips bloom, then just cut them after they bloom ( I sometimes do that if nice flower buds are forming). Otherwise, my best advice is to trip wisteria as you would an apple tree - hard, leaving one foot long stems. A more mature vine that is trained into a tree, may produce less vigorous growth. thank you for all of this info on wisteria. growing wisteria as a standard has been on my big wish, but back burner list along with attempting espaliered trees. i have just been waiting for my ADD middled aged self to actually acquire enough patience and self dicipline to attempt, what seemed to me, such a detailed & intimidating project. your post has made it seem very achievable. I am in southeast Michigan. 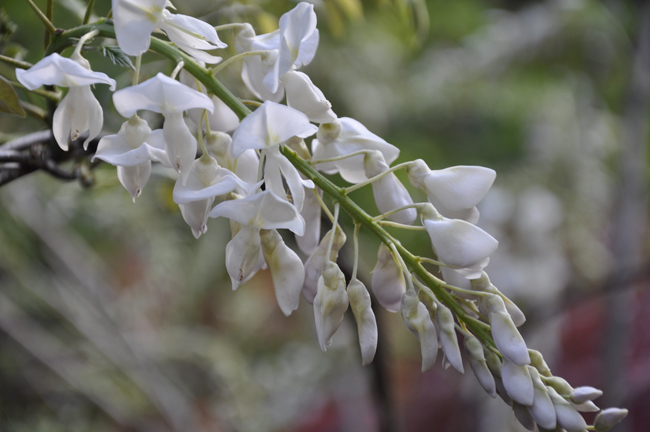 My wisterias are 17 years old, one Chinese and one Japanese growing on a pergola. I have never had much luck with flowers as they would often get frost damage. Also, they probably need more pruning. After the awful winter 2013/2014, we didn't even get leaves until late May. This year the Chinese variety is just starting to get leaves and the Japanese has none. So I'm thinking they are dead. Your thoughts? If they are dead and dying, would it be feasible to just cut back the Japanese variety to the ground and plant a Chinese variety in that location. I would then seriously prune the Chinese plant which is showing some life and see what happens next year. (I was at a nursery where they had put in a new plant and were using the gnarly old plant stem as the trellis.) Thanks for your help! I have fallen into tear this spring as yet Again my wisteria tree form has yet again NOT flowered. As a master Gardener here in a nice area of Chicago I have researched and believe I have done everything correctly in terms of pruning at all the proper times, not fertilizing, making sure to count the bud when pruning and prune hard, do it twice &then right times of year...I just don't know WHAT is going on?! I planted them close enough together that I was able to take one of the thicker young vines and simply loop it around the other halfway up the first yr. They are both staked still. I make sure to check that they are not too tightly tied to staking every year because they do grow so quickly& maybe any little thing might be making them not flower! Haha I'm quite literally worrying and driving myself Mad over it. I figure Both the tree form and the vine MUST have been at least a couple of years old. The tree maybe even 3 yrs when I bought it, and so this would now be 6 yrs. This seems like enough time to have been with me to flower. I do tend to prune the whips off again and again throughout the summer and do not wait and do it just once with the main summer hard pruning. I do this because it is by a fence I don't want it climbing. This spring I did think What's I thought might be flower buds as opposed to regular leaf buds but I didn't get a chance to find out as we had a very warm March that had all the plants popping up and then a sudden drop in temps in April with snow that lasted for a couple of weeks!! It was very hard on many plants. So far there has not been a lot of new growth and what I do see seems droopy. 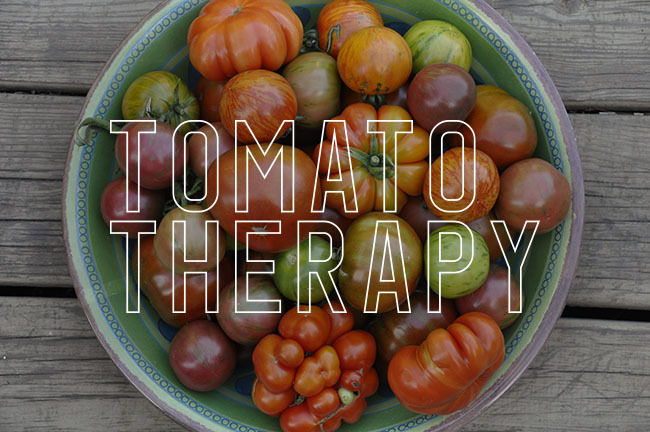 I'm at my wits end, and then all of a sudden found this great article!! I wonder if you might have a bit of advice for this Chicago Gardener? So sorry for a 2nd comment but I am really wanting to make this purple and white tree of mine work and flower. I am wondering on the exact purpose of the "whips"
I always thought they were purely for having it climb, and since I have been training mine as a tree I have been taking off the whips as the grow out. I have 30 roses in my yard-I understand those. Should I be letting those all grow out until I do the first hard prune late summer?? Maybe I should have been pruning the whips also? Hi Elizabeth - Im so sorry that this has been a challenge for you, I've heard from others who sometimes struggle getting even non-tree forms to bloom, while others seem to have no problem. Old techniques and theories abound from cutting roots/root restriction, to just letting them go wild. I have no problem getting all of our wisteria's blooming, but my theory is stress - as seedlings raised in bonsai pots seem to bloom with root restriction while seedlings from the same pod in the woodland and still clambering up tall trees with nary a bloom in sight. Only anecdotal of course. When I worked at a private garden years ago, we would trim the tree standards after blooming hard, and perhaps a few whips through the summer but we always allowed a few whips to mature and these seemed to bloom at the base of the whip (whips are just stems and there is no botanical difference from any other above-ground element). Whip stems are just advantageous-fast-growing stems, and I cut them about 3/4 of the way back. Many form flower buds on the remaining parts. I would see if that works first. Light might be an issue too, as most desire full sun for 8 hours a day or more. Hi Matt, I am new to both Twitter, and gardening. I am from South-West N.Y., ( 1 mile from lake Erie, 6 miles from Pa. I recently bought a ; 1) Wisteria vine, 2) Chinese Wist.tree, and 3) a Bonsai Wist. starter kit from seed. I would like to know more about raising them; pruning, fertilizing, etc. Thank you, Thomas C.
What an inspiring little post. Any thoughts on retraining an 8 year old wisteria from a vine to a tree? I had in on the corner of a deck, which as been rebuilt. I always pruned it quite strongly. It still has about 3 twisted stems established and a couple more loose stems. It's very strong and I am trying to prop it up straight with a stake as the new deck is not in the right place to allow for support and trailing. Any thoughts appreciated.